This is an interesting movie. A clever mash up of short film segments to explain a few important points. Hopefully some of it will be familiar. Contains footage of animal and human cruelty! It starts with the ways people can be conditioned to act, even against their own better judgement. Normative conformity, the pressure to conform is stronger than the desire to state your own belief, the fundamental flaw in open outcry democracy. It follows on to the conclusion we are all simply being farmed, just like the way we farm animals and plants. I have looked into how long this has been going on and as far as I can tell this happened this started with the first societies that developed settled agriculture in the fertile crescent. It seems that not long after people started farming they themselves became farmed. I guess its not such a large logical leap to put a fence around a cow and ‘own’ it than to put a fence around the farmer and ‘own’ the farmer. Further on it talks of political systems as being nothing more than farm management systems. We end with the premise that only option for a human society is one based on the non aggression principle, fairness and voluntary participation. Which I think sounds reasonable, but what would such a society look like and operate? I’m sure this will be controversial, but it shouldn’t be. The inconvenient truth is that the data must be false. What kind of chart is that? 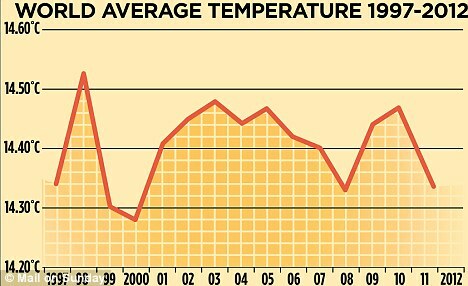 Any vertical line through a temperature chart should cross the charted line only once, as at any point in time, there is only one temperature at that given point in time. This chart is phony just like the guy standing in front of it. The following chart is however real. The fundamental point is earths dynamic systems are self correcting ( homeostatic), runaway processes are the exception. The sun determines the temperature on earth. 15ppm contributed by people’s activities. Remember this a thermal effect not a chemical effect on the green house effect. CO2 reflects some heat back but is unchanged in the process, and the human contribution is only 4% of the naturally produced CO2. The more CO2 there is the more plants are able to absorb it also. Global warming deniers are right wingers who know nothing about science and are just protecting their fortunes. Dr David Bellamy: Well known Botanist and environmentalist says there is no global warming. 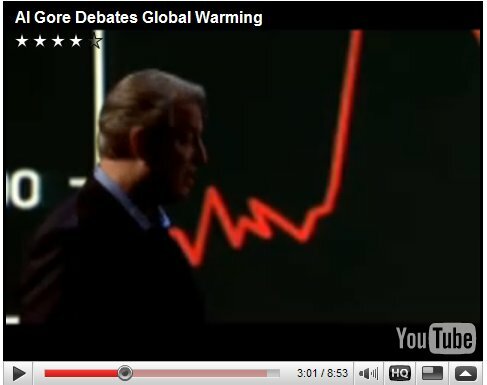 Al Gore: Ultra wealthy former politician promotes global warming and make enormous money from it. A letter he [Dr David Bellamy] published on 16 April 2005 in New Scientist asserted that a large percentage (555 of 625) of the glaciers being observed by the World Glacier Monitoring Service were advancing, not retreating. Previously Dr Bellamy supported Global warming, but he started to see the facts were not adding up. He has now predicted 30 years of cooler weather. How does he know this? He understands global temperature is influenced by solar heat output, which is influenced by cyclical variations in the suns intensity, i.e the sunspot cycle. The whole global warming scam is because the status quo don’t want to run out of oil just yet, so they want us to use less and pay more for it (and feel bad for using it). I.e. a tax on producing carbon dioxide, a tax on breathing. Look at how they are spending carbon tax money already: they are wasting it. This is yet another tax to prop up a failing economic paradigm. a way for central bank to print even more money and let you have even less of it by taking it back off you. You have been lied to by the global warming advocates, look back at some of their earlier predictions. If atmospheric CO2 is a result of burning fossil fuel it’s not really a problem as we are running out of fossil fuel anyway. I remember the first book I read at school as a young child. Chicken little. AKA Henny penny. Chicken Little. 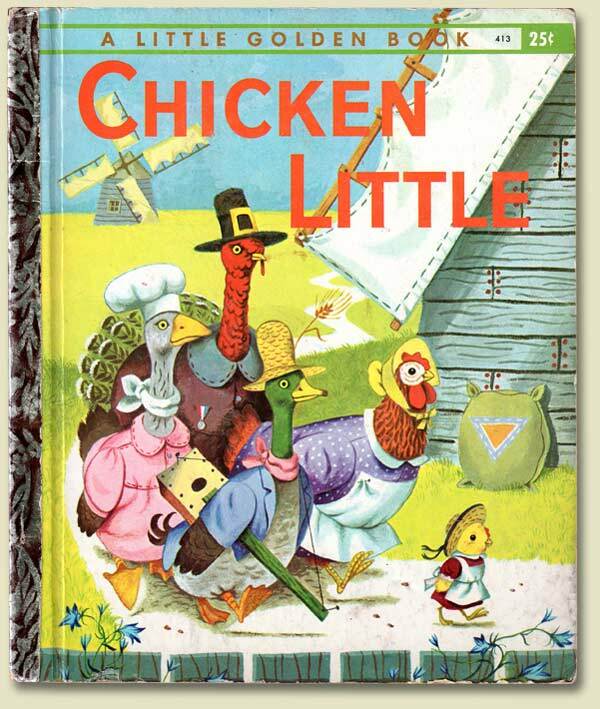 Golden book edition cover circa 1960. With it’s simple story and repetition of the character names it was a good place to start learning how to read. But more fundamentally it warns of using false logic and dangerous speculative projection based on failed logic to spread panic among your community. It was only when the wisest member of the community was told of the story, that the panic subsided. A nice way to show the axiom in science that one right answer has more weight than many wrong answers. In one of the several variants of the story an unscrupulous fox takes advantage of the fear of the group and kills and eats them all. The story is a modern retelling of many similar stories going back over 2500 years. Do you really believe the sky is falling? This story is older than Jesus, and people seem to be forgetting it; to their detriment. For anyone that’s into Buddhism, its part of Buddhist teachings. Another bonus of the global warming scam is they are scaring people away from coastal property claiming the sea will rise and wash them away, whereas in the future, many people will need to live close to the sea as it is an abundant food source. Historically many peoples have lived from food gathered from the sea. The sea is rich in phosphorus and water where as in many places these two substances must be added to the land to promote good harvests. this is especially true in Australia, how exactly are we planning to add phosphorus to the land in a post cheap oil world? Wouldn’t it make more sense to live close to the sea? The Status quo want to tax you for breathing and scare you away from the sea so they can use your money to buy up all the good coastal property and live next to the one of the best post peak oil food sources the sea. Having lived for a long period of my life on a coastal property, I saw the sand dunes wash away and then be rebuilt by different cycles of storm and calm in the ocean and weather. Even as I saw it happen over multiple decade length cycles, there would occasionally be a ‘sky is falling’ opinion, then along time resident with much gray hair would set the record straight: they saw it come and go, and come again. So is your sky falling or is it just an acorn? The world more likely to be colder in the future. Interestingly the mainstream media didn’t want to run the story until it had a prediction of doom attached. we survived these cool periods in the past, we will again in the future. Posted in Collapse scenario, Educational, Long Emergency, Movies.